Originating in 1949 and formalized by the Federal Communications Commission in 1967, the Fairness Doctrine sought to assure that broadcast licensees controlling a limited number of broadcast stations presented a balanced view on important issues. Back in 1949, Americans got their news from newspapers, and a fair number of AM stations, but there was a limited number of TV stations and a handful of FM stations on the air, and since there was a limited number of broadcast entities, the federal government wanted to assure that there was a balance of views on the public’s airwaves. In 1949, and later in 1967, the relatively limited access to information from broadcast sources might have justified the Fairness Doctrine, however, things have changed dramatically since then. Today we have more than 1,300 television broadcast stations; five thousand AM radio stations; more than four thousand FM radio stations, the vast majority of which didn’t exist in 1949 and were just developing and not in large numbers in 1967; we have abundant non-broadcast TV channels like MSNBC, CNN, CNBC and Fox; we have satellite radio, and we have the Internet. The number of available information sources has increased exponentially since the Fairness Doctrine sought to assure balance in broadcasting. With the profusion of information sources, whether broadcast sources present a balanced view today is far less important than it was 40 or 60 years ago. Supporters of reinstating the Fairness Doctrine claim to want to assure balance, but curiously they aren’t concerned with restoring balance in television network news, where that is a decided and undeniable Leftward tilt. No, what they want is to balance talk radio, a medium that developed and evolved through a trial and error process that responded to market forces. 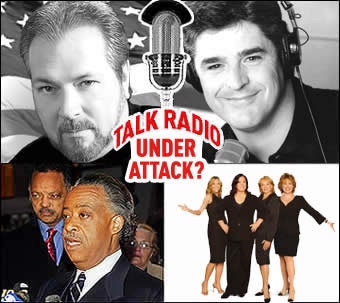 When AM radio moved into the talk genre, listeners decided they prefer conservative hosts, so talk radio has become a conservative medium. So now liberals, who were unable to earn market share with hosts that the listening public wanted to hear, now want the FCC to dictate that talk radio stations provide as much air time to liberals, who don’t have advertiser support, as they provide to conservatives, who do have advertiser support. They want the government to do for them what they have been unable to do for themselves. That is typical of liberals, who repeatedly want government to solve their problems for them, to give them what they are incapable of earning for them selves through honest means. Let us hope that there are enough fair-minded lawmakers in Congress that oppose this odious power grab, and save liberals from another humiliating display of government dependency.